Interior includes three layers of nonstick coating - two layers provide durability and the third layer offers easy release performance. Sauteuse pan has two loop handles for easy handling. Pans and covers are also oven safe, making it ideal for finishing a gourmet dish. Beautifully-shaped saute pan is great for simmering sauces, or making paella, oven casseroles and even frittata. The nonstick surface means you can cook healthier using less fat, with effortless cleanup. Comes with Calphalon's full lifetime warranty. Featuring a hard-anodized exterior and nonstick interior. Calphalon Contemporary Nonstick sauteuse pan combines durability and performance with fast clean-up and easy low-fat cooking. Heavy-gauge aluminum construction ensures even heating and is hard-anodized for durability. It also makes the saute pan dishwasher-safe. Interior includes three layers of nonstick coating – two layers provide durability and the third layer offers easy release performance. Two loop handles for easy handling. Pans and covers are also oven safe, making it ideal for finishing a gourmet dish. 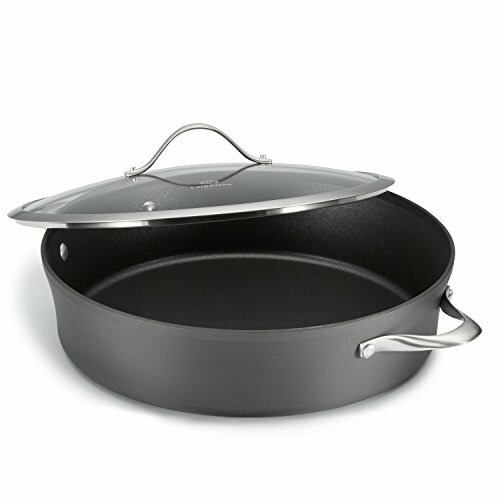 Beautifully-shaped pan is great for simmering sauces, or making paella, oven casseroles and even frittata. The nonstick surface means you can cook healthier using less fat, with effortless cleanup. Comes with Calphalon's full lifetime warranty.